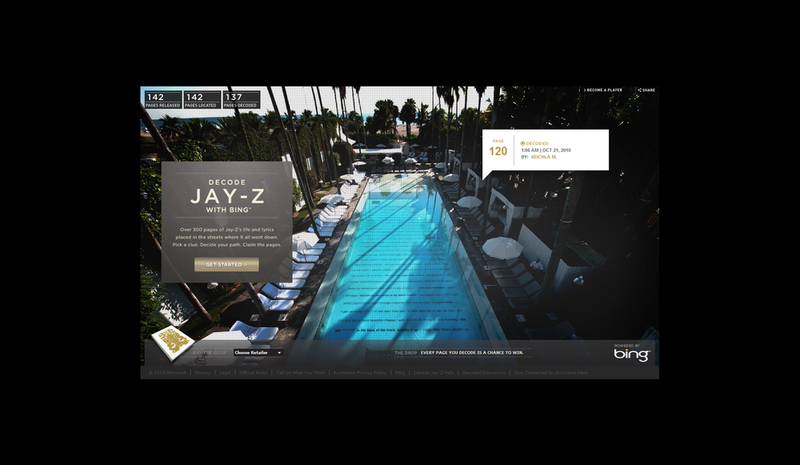 My role as UX designer in this groundbreaking campaign was to create the conceptual model for the game, write the game logic and design the user experience for bing.com/jay-z. The tactics for the campaign were well planned and executed, the idea: release every page of Jay-Z's autobiography out in the real world and have fans re-assemble those pages online. Each day several clues were released, over 400 in 4 weeks. 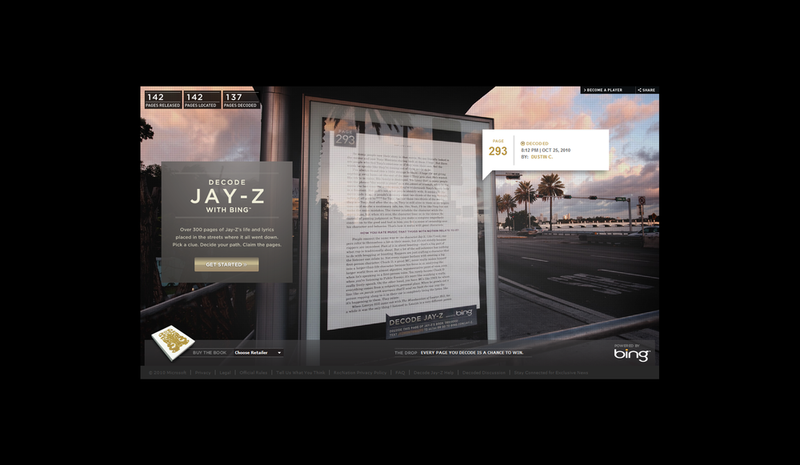 Fans used a custom-built version of bing search and bing maps to solve the clues, find the pages and then claim them. 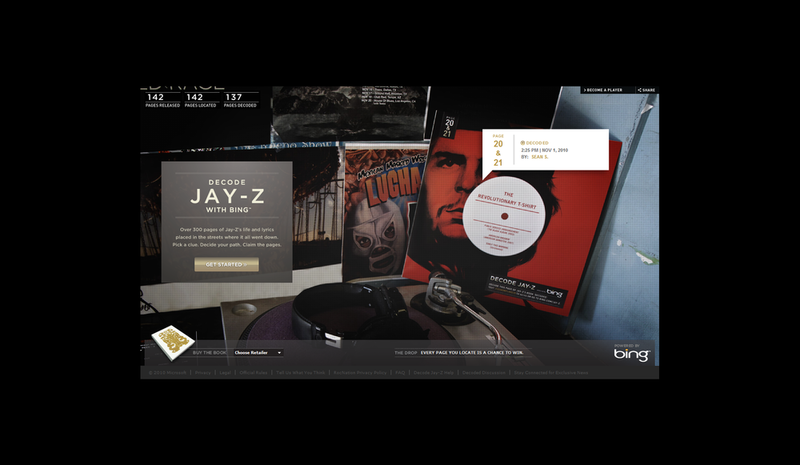 The fan to claim every single released page would have a chance to win The Jay-Z Lifetime Pass: free access for the winner and a friend to every single Jay-Z show anywhere in the world for the rest of their life. 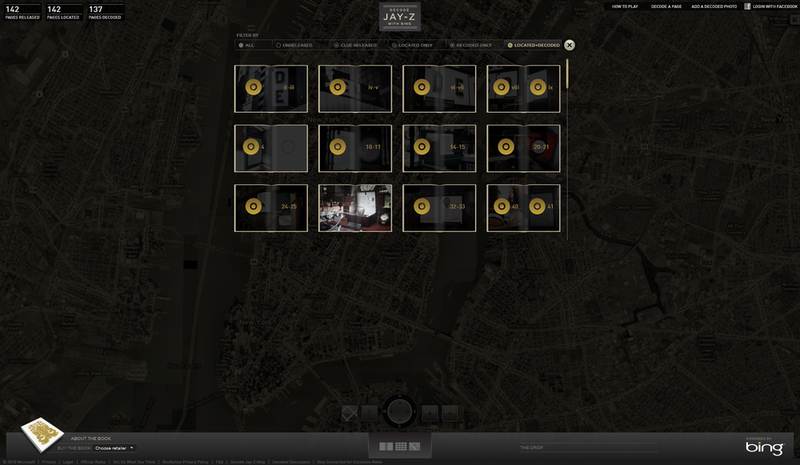 Jay-Z and his fans made history. In the four weeks leading up to the book's release, every single page of Jay-Z's first book, 'Decoded' was placed out internationally, in locations relating to their content. 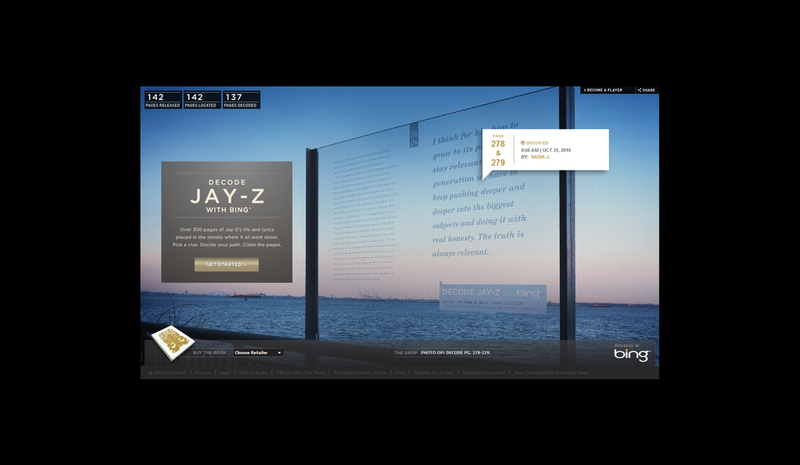 Pages appeared everywhere from billboards and bus shelters to swimming pools and pool tables; from Gucci jackets to burger wrappers and bronze plaques to Cadillac's. Fans found the over 300 pages on Bing Search and recompiled the book online before it hit the stores. Each day several pages of the book were released (the book was 320 pages, the campaign was four weeks long.) With bing maps and bing search as the game platform, two clues for each page. The answers to these clues were always geographic in nature; inputting your answers into the custom 'Decoded' bing map would get you closer to the location of a page. Once you located a page, a beacon would appear, marking the site of the page and whether or not you were the first to find it. User's claimed their pages by uploading their photos to the virtual page on the site.